How to fit over rack mezzanine floor or a free standing mezzanine floor? 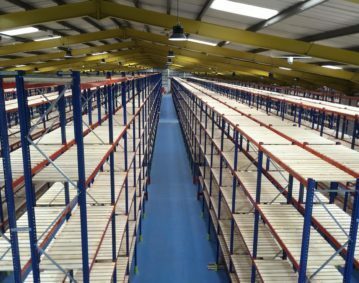 Do you have existing pallet racking and are considering adding an over rack mezzanine level to form a new mezzanine floor? Or are you considering a free standing mezzanine floor? If you have the option of doing either it is possible in most situations to install an over rack or free standing mezzanine floor without dismantling the pallet racking. You will have to carefully look at the cost options as often if retrospectively fitted the costs can often be similar. You will also need to consider fire protection and building regulations for means of escape, falling from height and other risks which fall under the current UK building regulations for mezzanine floors. Whatever type of mezzanine floor you are considering why not call our mezzanine floor design team here in Yorkshire on 01765 640 160.